You are here: Home / Redeeming Scripture / Did the Flood of Genesis 6-8 really happen, and if so, did God really send it? The flood of Genesis 6-8 is one of the most troubling passages of Scripture due to its violent portrayal of God. In general, there are three approaches to understanding the flood event. 1. Resistance is futile! Assimilate or die! It happened exactly as the text says, and God is sometimes very violent. Deal with it. If you don’t like this, God will probably be even more violent toward you in eternity when you burn in hell. But I love God, so He’ll be nice to me. And even though God said He would never again destroy the earth with water (Genesis 8:21), in the future, God will send a flood of fire upon the earth to destroy everyone again (2 Peter 3:6-7). 2. Flood? What flood? We don’t need no stinking flood! The account is some sort of myth. Maybe it complete fiction. Maybe it’s a fable of some sort that teaches a lesson about God’s hatred of sin. Maybe there was some sort of local flood that might have happened a long time ago, but it certainly didn’t cover the earth and kill everyone. Whatever happened (if anything happened at all), it didn’t happen as the text says. People who hold this view also reject the historical accuracy of many other passages in Scripture as well. Some will even reject the historicity of the miracles of Jesus, including His resurrection. I have never been comfortable with calling anything in Scripture an error, partly because such an approach often allows people to simply pick and choose which passages they like and which ones they don’t, consigning the texts they don’t like into hermeneutical oblivion. In other words, writing off a text as “error” allows a person to avoid seriously studying and teaching that text, thereby ignoring or missing the deep truth(s) it contains. 1. 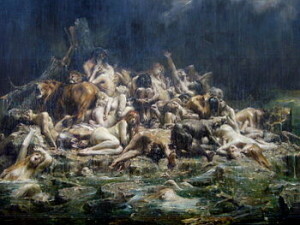 People were violent before the flood (Genesis 6:5, 11, 13). The stated reason for God sending the flood is because the earth was filled with violence. God seems opposed to how violent mankind has come, and so decides to do something about it. The flood brought no change to the evil and violent tendencies of the human heart. Isn’t this strange? If the stated reason for the flood was to stop the violence of humanity, then God seems to have failed in His task of stopping violence. Is God so foolish that He couldn’t look at the hearts of humanity before the flood and see that even if He killed them all, the survivors and their descendants would continue to constantly live with evil hearts and violent lives? To ask the question is to answer it. Of course God is not foolish! Something else must be going on behind the scenes. So … Wait … God hates violence? As soon as we start looking for what this “something else” might be, some other details from the text start to jump out from the page. For example … God states at the beginning of the account that He is sorry He made mankind because they are so evil and violent (Genesis 6:6). Ok, so God is opposed to violence. That’s a good thing. But then … to show how opposed He is to all the violence that covers the face of the earth … God engages in the greatest act of violence possible by drowning all the people and animals on the earth (except for those on the ark)? So to stop the violence that covers the earth, God sends a violent flood to cover the earth? Yes, “God is God and can do what He wants,” but this seems a bit over the top, even for God. If so, then since we become like the God we worship, it is no wonder that people were just as violently evil after the flood as they were before. 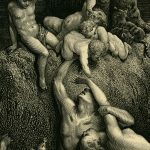 It is a very, very tiny step from believing that “God is extremely violent against evil people” to “God wants me to engage in violence against evil people.” Indeed, the rest of biblical history (along with all human culture) reveals this exact step taking place over and over and over again. If God really is so violent, why wasn’t Jesus? He didn’t call down fire from heaven, but rather rebuked His disciples for thinking such things (Luke 9:54). He didn’t call down angels to defend Himself (Matthew 26:53). He even told Peter to put away His sword, and then He healed the man that Peter has struck (Matthew 26:52). Yes, Jesus cleansed the temple, but no human or animal died, nor does the text say anyone was even hurt (Matthew 21:12-17; Mark 11:15-19; Luke 19:45-48; John 2:13-16). Yes, Jesus told his disciples to buy a sword , but this was to fulfill prophecy; not so they could actually use it. And don’t even get me started on the book of Revelation. If it is true, as Scripture says, that Jesus fully reveals God to us (John 1:14, 18; 14:9-11; 2 Cor 4:4; Php 2:6; Col 1:15; Heb 1:2-3), but Jesus was never violent, then we are faced with a choice: Either (A) God truly is violent and Scripture is lying when it says that Jesus fully reveals God to us, or (B) Scripture is not lying, and Jesus does truly reveal God to us, and therefore God is not violent, and we need to understand all those violent texts in some other way. I go with Option B: Scripture is not lying, and Jesus is not violent, so neither is God. If Scripture is not lying, but Scripture says God is violent, while Jesus shows that God is not violent, isn’t this a contradiction? But with one small little tweak on how you read the Bible, it all falls into place. Most people think the Bible reveals God to us. And while it does to some extent, the ultimate revelation of God is found in Jesus Christ (whom we read about in Scripture, of course). But Jesus shows us how to read the Bible. Jesus provides the interpretive lens through which to study Scripture. And when we look to Jesus, and specifically the most violent aspect of the life of Jesus, His crucifixion, and we carefully see what is being done to Jesus on the cross, we discover something surprising. God didn’t kill Jesus on the cross; we humans killed Jesus on the cross … and we blamed God for it. 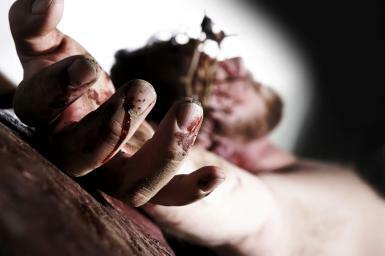 Humans killed Jesus and claimed they did so in God’s name, to fulfill God’s will. But they weren’t fulfilling God’s will. They were doing the opposite. They were committing the greatest sin in human history. And they were completely ignorant of what they were doing. This is why Jesus prayed, “Father, forgive them, for they know not what they do” (Luke 23:34). Through the cross, we see Jesus showing us how to understand the “violence of God.” The “violence of God” against Jesus on the cross is not God’s violence at all, but is rather the violence of humans which we then blame God for. Since we (1) Believe God is violent, we (2) become like the God we worship by engaging in our own violence, and (3) justify our violent actions by blaming our violence on God. But Jesus entered into this twisted framework of violent theology and blew it up from the inside. Through His death and resurrection, Jesus showed (1) that God is supremely non-violent and that (2) we humans are the violent ones. Once we see this revelation of Jesus on the cross, we then discover that all the other violent portions of Scripture reveal exactly the same thing. The violent texts of the Bible do not reveal God to us … they reveal us to us. The violent passages of Scripture are not a revelation of the heart of God; they are a revelation of the heart of humanity. But humans didn’t send the flood! So now we come back around to the flood. The flood event is extremely violent, and the text blames this violence on God. This fact invites us to read the flood through the lens of the crucifixion. And when we do, we realize that the flood account of Genesis 6–8 sounds like the explanation that is offered for any natural disaster throughout human history. “NO! No no no no no! Please stop saying such things! I didn’t send those storms. I didn’t kill those people. I love them and forgive them as my own children! It was a terrible disaster that happened to those people, and my only involvement is to weep and mourn with them, while calling you to go help them! So What Happened in the Flood? I believe the flood account of Genesis 6–8 was written many thousands of years after it actually happened, and is therefore a human explanation for an actual historical event. I believe it is an inspired and inerrant account of the human explanation for a natural disaster, and as such, it invites us to see how we humans explain natural disasters today. The people committed great sin (Genesis 6:1-4) and became monsters. They were so bad, they did nothing but evil all the time (Genesis 6:5, 11, 13). And so God destroyed them all! Yay! But … it didn’t really work, because we’re still pretty violent. So be careful … If you sin against God, He might destroy you too! Do you see? A flood did occur. It was a terrible natural disaster unlike anything the world had ever seen. After the fact, the few survivors started to postulate about why such a disaster occurred, and, just like every human before and since that time, they decided that God sent the disaster to punish humans for their sin. But now, in Jesus, we have learned that this is not what God does. So when we read the flood account of Genesis 6–8, we no longer read it as a warning about what God might do to us if we sin, but rather as a warning about how we will be tempted to think and act when we see bad thing happen to other people. Looking at our face in the mirror of Genesis 6–8, we must ward ourselves against the common human practice of condemning others when bad things happen to them. We must stop saying, “Well, he lost his job and got cancer, so God must be punishing him for some secret sin.” (Remember Job?) Instead, when bad things happen to people, we must, like Jesus, enter into their hellish pain and sorrow, and help them or love them in in any way we can. When bad things happen to others, we must remind them (and ourselves) that God did send the disaster and is not punishing them for sin. Instead, He is with them in their suffering and grieving for their loss. So the flood account is a hard text to read. Not because it reveals a God before whom we must cower in fear and trembling, but because it reveals to us the blackness of our own sinful hearts when we prefer to condemn others in God’s name rather than help them through their pain. The next time something bad happens to a family member, friend, or foe, how will you respond? That is definitely a common view! 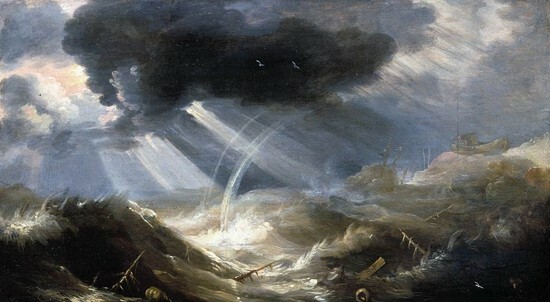 Jeremy I have always struggled with the great flood being sent by God to destroy evil humanity. I have never doubted that the flood happened and that their was Noah’s Ark but the violence of flood didn’t fit in with the concept of a loving God. Seeing it through the lens of Christ as you recommend changes what we see. I have always like the concept of the bible being a mirror which when we look it at we are often not looking a God but ourselves when it comes to violence in the bible. 2 Corinthians talks about his word being a mirror which is able to transform us. In this case it shifts our gaze from a violent God to our violent selves. As you rightly point out if God wanted to stamp out evil using the flood then He failed badly. God being able to see the future he knew it wouldn’t work anyway, so why do it? If he is not evil then he didn’t cause the flood, but people were content to blame him, as an angry God made sense to them as it matched their view of the world. Christ being God was never angry or murderous so it debunks the entire cause of the flood event. Thanks, Grahame. My explanation takes some explaining … but I think that once people see it, it helps better explain some of these texts in Scripture. Great explanation Jeremy as always I love your insight brother. Thanks, Ronnie! And thanks for the comment. Hello Jeremy, I didn’t participate in this blog because I am still wrestling with Noah’s ark and the flood. I understand your point of view however, it brings up questions. 1) Are you saying that God didn’t repent for making man, and that this is how the writer of Genesis saw the flood? 2) How do you explain God telling Noah to build an ark? Was that simply God’s foreknowledge of a flood coming or is Noah simply symbolic of the people who survived? GREAT questions. I think God was sorry that mankind went in the direction it did, but I don’t think He was sorry He made mankind. God redemptive purposes required that He create humanity, and He knew that our rebellion was a distinct possibility (maybe even unavoidable). But you are right that this statement requires closer examination. I believe God knew that the flood was coming, and so told Noah to build an ark so that humanity could be rescued and delivered from the flood. Could you write something like this about the 10 plageus that hit the Egyptians? I find it hard to read scripture the way you do not because I don’t agree just not enough knowledge I think? I believe like you that, the flood really happened. And one reason was probably the violence of mankind and their inclinations for doing bad things all the time. But I also believe that one thing that also triggered the event is the fact that “sons of God” came on earth and took human women to have children with them. 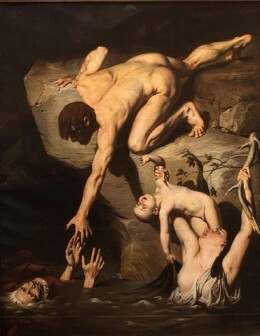 It says that these children were like giants and the heroes of the mythologies. But who knows what it was really like on earth in those days because of all that. God probably had no other choice to do what he did to stop what was started just like he did with the Babel tower later on. That’s just my opinion here. Yes. I didn’t mention the Sons of God, but it is true that Gen 6 points to their involvement with human women as one of the reasons for the flood … and maybe also one of the causes for the violence. Wow. The last several years have been interesting to say the least, rethinking so much of what most of us were raised to believe as Christians. And this post brings up quite an interesting point I never really thought about before. I’ve rethought how we “do church”, the inerrancy of the Word, and a lot of assumed “truths”, a list that just got one item longer. I’m so sick of tradition. Your blog is a breath of fresh air! I want to make people think! Glad this site is doing this for you. I always appreciate the comments as well, even from people who push back or ask questions to help refine and sharpen our thinking on these topics. Thanks for reading! Is it possible that because the people had so rejected God’s presence within them, that He had to withdraw from them and then Satan came in and caused the flood??? God is a gentleman, we have free will and if we reject Him, he leaves us to reap what we have sown – He does not force Himself upon us if we don’t want Him. His Spirit strives long and hard to woo us, but we make the choice. As God had foreknowledge of this almost universal rejection of Him, He inspired Noah to build the ark, so the the line to Messiah could be saved?? This sounds very similar to Greg Boyd’s approach. Have you read his books “Crucifixion of the Warrior God”? So yes, that is a possible way of explaining this text. But I don’t like the idea that God withdraws from us. Jesus said He will always be with us and will never forsake us. I think God behaves similarly. Thanks a bunch, Jeremy. Your analysis is very helpful. I agree that the portion of Scripture in question shows the godless state of man’s heart and man’s tendency to blame God for self-inflicted misfortune. Thank you, Jenom. Glad the study was helpful.